We are making the figures available in electronic form so you can use them in your lectures, presentations, or documents. If you use them, please acknowledge our book. "This is the most comprehensive book on network systems, covering design and evaluation techniques from the link layer to application layer. It beautifully blends networking with architecture and operating systems with just the right amount of detail. 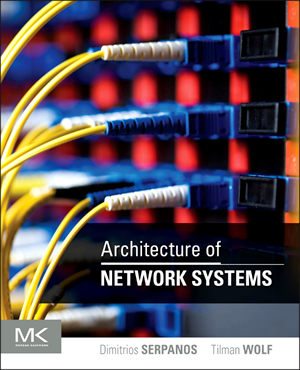 The book will serve as an outstanding text and reference for graduate students and researchers in the emerging area of architecture of networking systems." "Architecture of Network Systems is a very well-written book that covers fundamental concepts, principles, and protocols in networking/switching, as well as their real implementation solutions. I'd highly recommend it to people studying or working in computer networking." "The Architecture of Network Systems goes beyond describing what networked systems do, to explaining how they work. Serpano and Wolf do a great job demystifying how the network infrastructure – from network adapters and switching fabrics to high-end routers and servers – actually works. The book captures the state-of-the-art for designing networked systems that offer guaranteed performance, high security and reliability, and energy-efficiency, including recent trends in network processors, network-on-a-chip, and network virtualization. The book is an invaluable resource for students, researchers, and practitioners alike – for anyone using or building the networked systems that have become such a critical part of our communications infrastructure." "A good introduction to the issues arising in the design and implementation of network systems." "Serpanos and Wolf present a unique book on the architecture of networked systems. Thereby, both large-scale networked systems as well as networked embedded systems are addressed. This comprehensiveness makes the book an excellent base of knowledge for readers from either domain. For example, Serpanos and Wolf include chapters on power issues, networks on chip etc. that are not found in classical network books. The value of the book also comes from the remarkable balance between level of detail on the one side and coverage of topics on the other side. The unique composition of the book reflects the author's leading research role in both the embedded and the network domain." © 1997-2018 Tilman Wolf. Site Policies.